Among the wonders of this poem is Al-Busairi’s ability to keep the “mim” letter rhyme every 2 verses throughout all 161 couplets. I will try to maintain the consistency in my inadequate translation. Atau rindukan bayu dari Kaazhimah? Di balik air mata dan resah-gelisah? You shed blood with your tears? Or lightning in Idham, that pierce the darkness? And your heart, you said “be calm”, it grows more restless? Behind his tears and restlessness? Campur semua bahan kemudian mesin. Tuang sedikit campuran sehingga setengah paras acuan. Tambahkan 1/2 sudu teh gula. Kemudian tuangkan campuran yang sama hingga 3/4 penuh acuan. Tutup acuan. Bakar sehingga masak. Mix all the ingredients then blend. Pour the mixture into a mould about halfway full. Add about 1/2 tea spoonful of sugar. Next pour the same mixture until about 3/4 full. Cover the mould and bake until fully cooked. 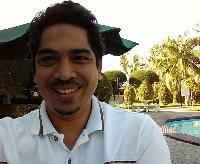 I am a freelance translator with an academic and professional background in Information Technology and engineering. As a paid freelancer, I have translated texts on pedagogy, technology magazine, and tourism. I am capable and competent in translating IT, engineering, and other scientific content. Saya seorang penterjemah bebas dengan kelulusan dan kerjaya dalam bidang Teknologi Maklumat dan kejuruteraan. Penterjemahan berbayar yang saya pernah lakukan ialah teks-teks pedagogi, majalah teknologi, dan pelancongan. Saya berkebolehan dan mempunyai kelayakan menterjemahkan kandungan dalam bidang IT, kejuruteraan, dan laras-laras sains lain. Experience Years of translation experience: 11. Registered at ProZ.com: May 2010. Became a member: Dec 2010. 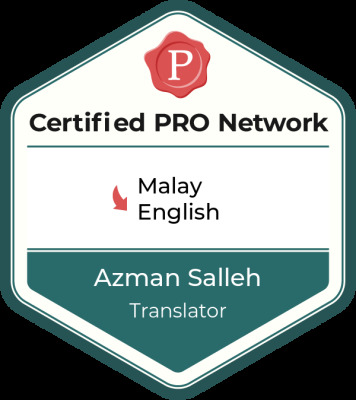 Professional practices Azman Salleh endorses ProZ.com's Professional Guidelines (v1.1). As a freelancer, I have translated texts on pedagogy, technology magazine, and tourism. 2. English – formal primary/secondary school education; graduated with degree from college in the USA; English as main language at work. 1991 – 1994	Bachelor of Science in Computer Engineering from California State University, Sacramento, USA. I have a 10-year experience in translating various documents from English > Malay and vice-versa. • Policies on password, encryption standard, incident escalation etc. • Policies and software localization. • 26,000 words in MS Excel file. •	Emphasis on teaching children with special needs. I have also written unpublished translation from Malay > English and Arabic > English on Islamic texts and poems. I also have experience in transliterating old Malay>modern Malay texts. For the benefit of a study circle, I have copied a few classical Islamic Jawi texts into the equivalent Latin alphabets (total 40+ pages).